XSEED has picked up Vanillaware's recent PSP release, the turn-based RPG Grand Knights History, with the intention to publish it in both UMD and digital releases this winter. Rising Star Games will publish it in Europe at an unspecified time. 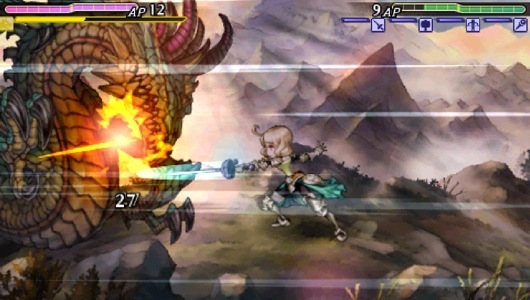 Vanillaware, if you can't quite place the name, is the developer of absurdly pretty 2D games like Muramasa: The Demon Blade, Odin Sphere, and the upcoming Dragon's Crown. Grand Knights History depicts a war between three European-style nations, Union, Avalon, and Logres. Players choose one of the factions, recruit teams of soldiers, and face off against the other two armies in battles that take place over 30 hours. Each team member is fully customizable. During TGS, I spoke with producer Yoshifumi Hashimoto, from development partner and publisher Marvelous, who explained the unique online functionality of this title -- the part that he thinks will help appeal to western audiences. "The way it works is you have these four parties online," composed from within a group of 32 characters you've built. "When you're online, you can take direct control of one of these; the other three will battle automatically. The other three parties are synced up to the server. But if you can't get online, all four will fight on their own." While the online play is seen as a feature to draw in western players, the choice of gameplay system displays what seems to be a uniquely Japanese view. "The reason this was chosen: we did Muramasa: The Demon Blade with Vanillaware previously," Hashimoto said, "an action game. Some people are good at action, and some people are not. So with this game -- everybody can play a turn-based battle, and so every player will be able to get through the story and see the end, which is what we wanted."